Definition of autonomous consumption: This is the level of consumption which does not depend on income. The argument is that even with zero income you still need to buy enough food to eat – either through borrowing or running down savings. 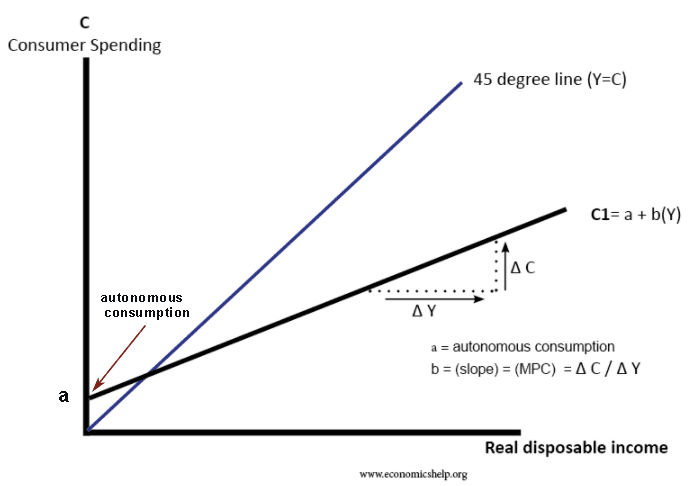 In the Keynesian model of aggregate expenditure, autonomous consumption plays an important role. C = a +bY. In this formula a is the level of autonomous consumption, where b is the marginal propensity to consume out of income. Assets such as houses – with assets, people can gain equity withdrawal – remortgaging the house to take out a loan. Expectations of future income. Expected future income gives consumers more confidence to borrow. Difficulty/ease of borrowing money to finance the autonomous consumption. Payday loans are often used by people in low-income who want to maintain day to day expenditure. Time period. In the short-term, people have commitments to pay bills so autonomous consumption is quite high. However, if the period of no income persists, individuals will ‘downsize’ – ending phone contracts, move to cheaper accommodation, and every trying to grow your own vegetables. Minimum standards of living and ideas of absolute poverty.